By putting the extraordinary I-Pace Concept into production virtually unchanged, the Jaguar I-Pace will transform the Electric Vehicle (EV) design. 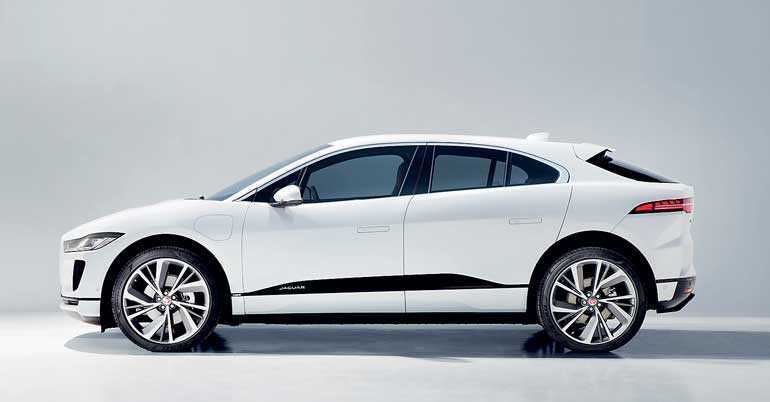 The new I-Pace will be available through SML Frontier Automotive, sole agents for Jaguar in Sri Lanka. The Jaguar I-Pace heralds a revolution in car design, bringing concept car looks and SUV practicality to showrooms in 2018. A concept car made real, nothing else will look or drive like the Jaguar I-Pace. The Jaguar I-Pace will transform EV design. Its dynamic looks and dramatic lines combine a long wheelbase of 2,990mm with an overall length of 4,682mm, giving the vehicle a similar footprint to the Jaguar F-Pace, with the interior space of a much larger vehicle. The dramatic lines and bold proportions are a direct result of the advanced electric drivetrain and architecture that underpin the I-Pace. The cab-forward profile is a natural progression of Jaguar’s design language, retaining key characteristics including the grille and distinctive sweep of the daylight opening. With its exciting proportions and sleek coupé-like silhouette, the I-Pace takes inspiration from the Jaguar C-X75 supercar – including its sweeping front fenders, dramatic curves, muscular haunches and striking waistline, as well as imposing 22-inch wheels. Allied to aerodynamic features including a low bonnet, sweeping roofline and squared-off rear, the I-Pace has a drag coefficient of just 0.29. The grille has evolved into a bold aerodynamic feature, channelling airflow through the integral bonnet scoop and over the windscreen onto a coupé-style roofline to reduce drag. Airflow for battery cooling and the climate control system passes through Active Vanes in apertures in the front bumper, which open when required, and the grille. Flush door handles preserve the clean lines and contribute to the superb aerodynamics, emerging from the body at the push of a button on the key fob, or when touched. This attention to detail is heightened on models equipped with optional air suspension, which improves efficiency and optimises range by lowering the vehicle by 10mm at speeds above 65mph (105km/h) to reduce drag. Jaguar Land Rover’s new Matrix LED lighting technology emphasises the clean lines of I-PACE, resulting in compact headlights that incorporate Jaguar’s trademark double-J graphic with sweeping indicators. The attention to detail, state-of-the-art functionality and advanced Touch Pro Duo ‘flight deck’ infotainment combine with the distinctive floating centre console to set an interior design standard for others to follow. Vibrant HD displays, touchscreens and capacitive switches complement multi-function, haptic rotary controllers for an engaging, intuitive experience. 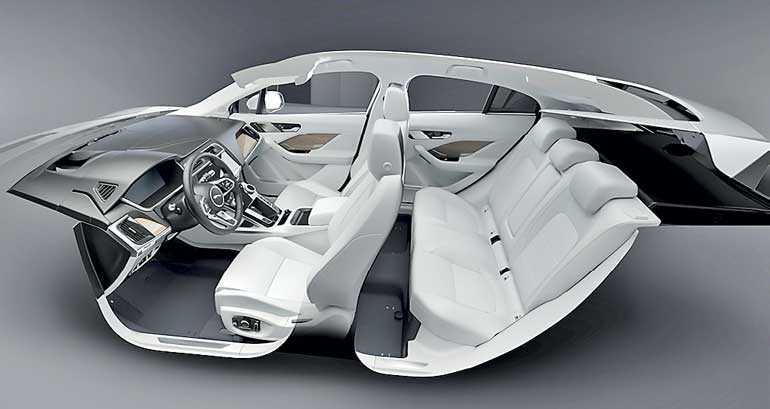 The generous interior offers 890mm of rear legroom and includes ingenious stowage areas. With no transmission tunnel in the centre of the car, there is room for a 10.5-litre compartment in the centre console for phones, keys and other small items. Trays under the rear seats also provide perfect storage for tablets and laptops. The rear luggage compartment capacity of 656 litres is also larger than most medium-sized SUVs, increasing to 1,453 litres with the seats folded flat. Despite the dramatic sloping roofline there is plenty of rear headroom (968mm) because of the low-slung seating position, which provides a sportier, more enjoyable driving position without compromising posture or space. The optional, full-size panoramic roof floods the cabin with light and gives the interior an even greater sense of space. Both the glass roof and windows absorb infrared light, keeping the cabin cool and removing the need for blinds. Customers can choose seats upholstered in either fine-grain Windsor leather or a sustainable, premium textile alternative developed with Danish textile experts Kvadrat – a high quality material that combines a durable wool-blend with recycled technical suede cloth. Materials are carefully chosen to provide a blend of natural finishes and high-tech surfaces, including deep piano black, satin wood grain and precision-machined aluminium.